In our review of the development of Newark´s earliest streets and roads, it is important to remember that in addition to the Connecticut settlers´ original street pattern for Broad and Market streets, the city also had many ancient highways. They served many purposes—connecting downtown Newark with settlements on First and Second Mountain as well as with 'the outside world' of Elizabeth, Paterson, Belleville and Paulus Hook, part of today´s Jersey City. In some instances, the highways came from early Indian trails. Overall, they became the spokes in a transit hub that would eventually unite Newark with outlying suburbs and beyond. Under colonial law, it was the duty of the overseer of roads to call local inhabitants to repair the roads, bridges and causeways and to keep them in overall good condition. Three roads led out of town in a westerly direction. One was Orange Street, another followed the line of Warren Street and the old Crane road at Roseville, and another followed the line of Centre Street to the river near the public land site. Broad Street continued to the Elizabeth Road to the south, and to the north Belleville Avenue, now Broadway, followed a line to Lincoln Avenue and crossing into Belleville at the old stone bridge over Second River. The first road, laid out in 1698 by the commissioners of highways, was the road to Elizabethtown. In 1705, the commissioners for Newark were Andrew Hampton, Theophilus Pierson and Jasper Crane. They made plans for nearly a dozen highways, but the descriptions that have survived are so vague there is some doubt that most were really constructed. Here´s an example 'First, a road from town to the foot of the mountain, or Wheelers, as the path now runs as straight as the ground will allow,' or a 'road from said road, south, by a line of marked trees to Joseph Riggs´ house.' Another: 'A road running by a line of marked trees unto Anthony´s house to first mentioned road by a line of marked trees and a path to the other road running from Anthony´s road to Caleb Ball´s house by a path of marked trees.' These probably were private roads, many of which were never constructed. But some highways did exist, such as the road to 'Hocquakanong,' which went from north Newark to Acquackanonk meeting house and then on to Pompton. This road, which dates to at least 1707, is identical to River Road. In 1709, Newark´s High Street was laid out on the community´s western border. In 1717, several roads were established in the 'Neck,' Ironbound, for the convenience of farm owners to harvest their salt hay. In 1806, the first of the local turnpikes was established when the Newark and Pomp ton Turnpike was incorporated in February. It ran to Bloomfield, Crane town (Montclair) and over First Mountain through Cedar Grove to Pompton Plains. The Mount Pleasant Turnpike Co. came into existence in 1806, and went west to Morristown. The Essex and Middlesex Turnpike Co., incorporated in the same year, connected Newark to Elizabeth. The Springfield and Newark Turnpike Company ran from the Essex County Court House to Camptown (now Irvington) and then on to Springfield. The Newark and Morristown Turnpike followed the line of South Orange Avenue, running directly to South Orange and then to Columbia Bridge. Valley Road is one of the earliest roads designed to reach the northeast part of Essex County. The Old Road to Bloomfield ran in the vicinity of Second Avenue up the hill to Mount Prospect Avenue. Today, a tiny bit of it survives, for it is the road on which Newark´s oldest house, the Sydenham House, stands between Elwood Avenue and Heller Parkway. By the end of the 18th and beginning of the 19th century, many of these roads were changed, lost their identity or were abandoned. But others became spokes in the city transportation hub, survived and are now part of the county road system. If only they would speak, what a story they could tell from horseback and stagecoach days to the era of the auto and bus. Their arteries have been the city´s and county´s lifeblood for generations. The 17th and 18th centuries were a time for the geographical evolution of the township and later city. Newark, which began as a huge land mass that included most of Essex County and parts of adjoining counties, began to break apart after the Revolution into several smaller communities. In the 19th century this tendency was reversed. Land was gradually reannexed to the city. The time had come to fill in all those empty spaces in the city with major streets, and to utilize land within the town´s new boundaries. Added to the founders' original streets were many of the streets we travel today. A geographical pattern of a modern city was slowly emerging. The index of the 'Hagstrom Streetmate Map of Newark' and Broad National Bank´s 'Map of the Greater Newark Area' indicates approximately 810 entries. While it is not possible to give a history of each street, some of these byways are of more than a passing interest. Today, we begin an extensive look at some of them, starting with a street with a very peculiar name. Pot Pie Lane was the original name of Chancellor Avenue, based on the tradition that local housewives prepared chicken pot pies at the time of the Revolutionary War for the troops when Gen. George Washington visited the Old School House now located in the Newark Museum garden. Because the name was considered undignified by some, it was changed to Prospect Avenue in 1834, when the area was incorporated as the former Clinton Township. In 1902 it became Chancellor Avenue in honor of Chancellor Oliver Spencer Halstead, whose house stood on the present-day site of Weequahic High School. Halstead, a Princeton graduate, studied law in the offices of Governor Ogden, served in both houses of the state Legislature and helped draw up the Newark City Charter of 1836. He was a delegate to the 1844 New Jersey Constitutional Convention and was elected Newark's fourth mayor. In the 20th century the area was developed into a residential section by Frank J. Bock. It became known as the 'Weequahic Tract,' home to many of the city's prominent Jewish families. East Back or Mulberry Street as it was to be known later, was one of the four streets laid out in the 1660s. Fortunately, most of its name has survived a recent name change. House lots of the original settlers on it included those of Robert Treat, Thomas Johnson, George Day, Nathaniel Wheeler, Micah Tompkins, Jonathan Tompkins, and Ephraim Pennington. In the earliest days, the street was essentially a farm lane. Its first buildings were isolated farmhouses. By 1800, as the nation became fascinated by a growing silk industry, Newarkers began to plant mulberry trees along the street to feed silk worms in an attempt to develop a local silk industry. The industry failed, but the street survived to become a mixed commercial/residential neighborhood for a century. Eventually, it became a blighted neighborhood. But in the meantime several churches began tending their flocks there including St. John's, 'the State's First Catholic Parish,' the German Lutheran Church, Emanuel Methodist Episcopal Church, and the Walnut Street and Park Church chapels. Only St. John's survives today. The homes of the Turnbull and Cumersell families gave way to parking lots in the 1950s. All evidence even of the Turnbull and Cumersell Coach Company at 90 Mechanic St. has disappeared. In the 1880s, Mulberry Street was known for its varnish and tool factories and for the Hebrew Orphan Asylum at Green and Franklin streets. 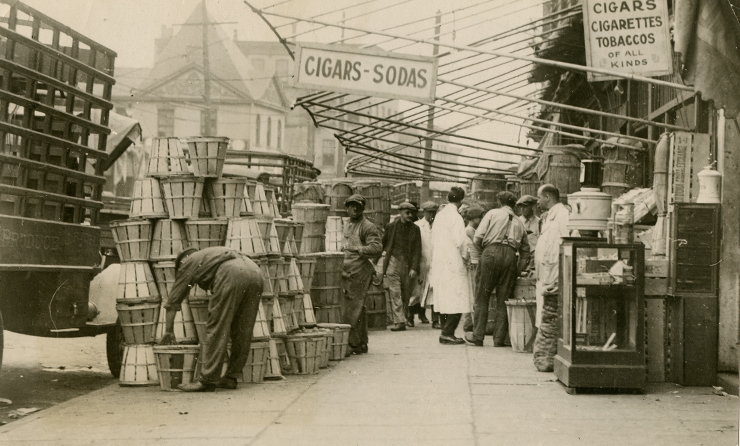 In the 1920s, Chinatown was located between Lafayette and Green streets, and was known as far away as New York City for its gambling, drugs and rival gangs. The HipSing and On Leong rivals engaged in an infamous tong war which scattered that community north and south of Newark. By the 1950s, the Newark News reported 'In more recent years—and continuing today—the street has earned a widespread reputation as one of Newark's most unsavory thoroughfares, a broken boulevard of alcoholism, crime and vice.' (News Feb 2, 1954) Just as Newark is changing, so is Mulberry Street. Today, standing at its north end is the splendid New Jersey Performing Arts Center. The one block section, renamed for Ronald Brown, passes behind the Robert Treat Hotel, the headquarters of the Episcopal Diocese of Newark, St. John's Roman Catholic Church, One Newark Center with Seton Hall Law School and the shiny glass tower of PSE&G. Moving south, you can see 1100 Raymond Building under renovation. The ground-floor level at the corner of Mulberry offers the best brioche in town. Nearby, Gateway 3 and 4, are part of one of New Jersey's largest office complexes. The building at 111 Mulberry, once the headquarters of the old Newark Evening News, is now Renaissance Towers condominium, a good example of a successful downtown adaptive rehabilitation. Moving south along Mulberry, we are within yards of the Newark Police Headquarters, the back of City Hall and Federal Square with its complex of the U.S. Post Office and the splendid new Martin Luther King Courthouse. Nearby, is the office of another important New Jersey newspaper, The New Jersey Law Journal. Who knows what the future holds for the entire area? A giant new sports arena has been proposed nearby. Perhaps a portion of the city's future will depend upon its construction.